Many years ago, when I was a young girl, full of ideas and dreams of grand adventures, I lived in . . . . Yes, after my two year college stint, I came back home to live with my parents, until my Prince Charming whisked me off my feet and carried me away to far away lands. Anyway, during that time, I started crafting. 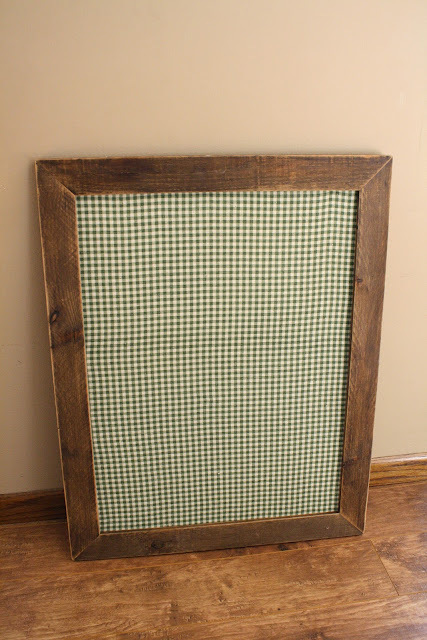 I was a big Martha fan back then and from one of her magazines I learned to make this fabric covered bulletin board. Even all those years ago, I was a big thrift store fan. What can I say, I learned it from my Mama. 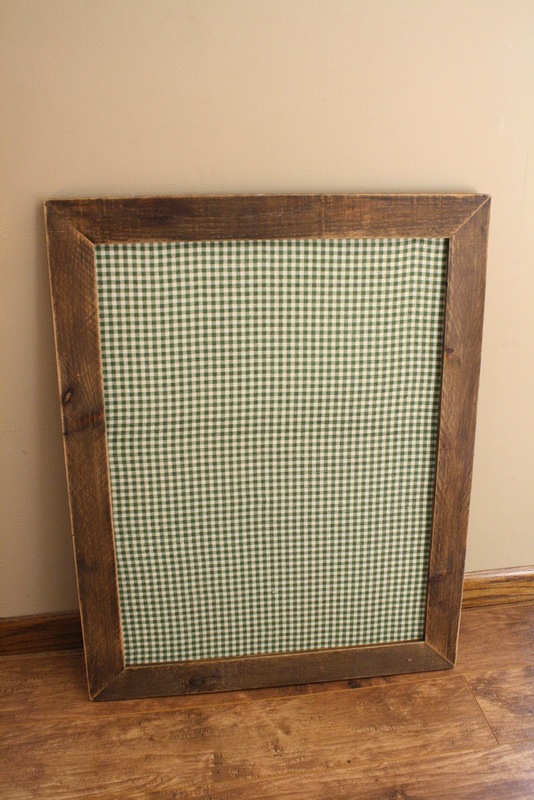 I found this frame, and the fabric at the St. Vincent Thrift Store and bought the bulletin board at Menards (where I happened to have a part time job at the time). Please remember, back then, country and lodge decor were pretty cool and forest green was the color to decorate with. This bulletin board has served me well through the early years of my marriage, matching nicely with my forest green couches and moose plates. However, just as fashions have changed over the years, so have my decorating tastes - thank goodness! Consequently, I have been wanting to redo this bulletin board for a long time, but I have just continued to use it as is, because it was still functional and was hidden from sight in my laundry room. However, with the redo of the laundry room paint, the colors on this bulletin board wouldn't do anymore. After looking and looking, I finally found a fabric that I liked (and that I could afford). A little spray paint, some new fabric, and I have a transformed, much more contemporary and fashionable bulletin board that matches my laundry room. Here it is in the laundry room. I have really bad lighting in my laundry room, that I am hoping to replace, but until then, you'll have to tolerate the pictures being a little off color from the lack of good lighting. It's hard to tell, but I painted 3 walls in my laundry room a dark pink. I took a risk putting such a bold color in such a small room. I really love the shade of pink I chose, it's kind of like a raspberry pink, but I'm not sure I love the end result in here. Part of the reason, I'm sure, is the lighting issue I have. The other part is because of the fact that I have not been able to complete decorating the room the way I want. But the other part comes down to the fact that I should have gone with a lighter color because the 'look' I really love, in all the pictures in all the magazines I look at have that light, airy cottage feel to them. Not hot pink. What can I say? I was feeling daring at the time. I even thought about it for weeks, put up paint chips, eliminated the wrong colors, vacillated between orange or pink. Sometimes, no matter how much you think and plan, you just don't love the end result like you thought you would. Here's my other problem. Do you see this mess? (I can't believe I'm actually putting this picture up for the whole internet world to see! Eeeek!) How in the world am I supposed to organize this? It's a dumping ground! It always looks like a disaster, and I am the worst at putting stuff on the shelf because I don't have anywhere else to put it. This is where we keep our shoes and coats, so it's our mudroom/laundry room. And in my opinion it's way too small for all the things it's supposed to do, but the size isn't changing so I need to find the best way to make it function. Any suggestions? Only cheap suggestions please. I also need to get rid of that ribbon bulletin board. The cream fabric really doesn't look very good in here now. Unless - maybe I could recover it? Do you think there is a tutorial for that online? Hmmmm. Maybe that will be my next project. i love that fabric, i've covered a few things in it already! what about those inexpensive plastic drawer units to get everything off the shelf? then you could use baskets and file folder systems on the shelf. Yes, I think that is a wonderful idea about covering the ribbon board. and the only suggestion I could possibly have about the mess is just make everybody (including yourself) pick up after themselves. :-) Good luck with that, I think it may be so late, what do you think? I love reading your blog!! I meant to say I think it may be to late.